Fr. Richard McGurn, SJ, M.A. Psych., M.Div, was ordained in 1975. He directed the internship for spiritual directors at the Jesuit retreat house in Cincinnati. 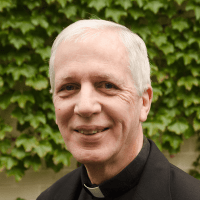 He has served the major superior of the Chicago Jesuits as his executive assistant and as director of formation for young Jesuits preparing for ordination and ministry. Just prior to coming to Bellarmine, he was superior of the Jesuit community at Loyola Academy in Wilmette, IL.